Brave Miners is a new mod for MCPE based on the Core Engine. 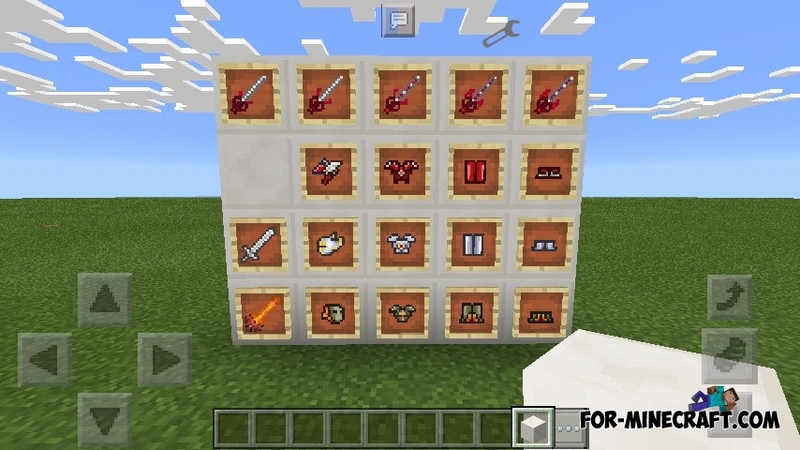 This mod adds new ores, swords, mobs and much more! The main difference from the others is the emphasis on PVE mode, that is, you have to fight very dangerous creatures and survive using new things and crafting recipes. The Brave Miners mod is formed gradually and most of the innovations are taken from popular survival games. Many things used in Terraria have been moved here. It transforms different materials into dark energy. For example: bedrock gives 100000 of energy, mossy cobblestone only 150. 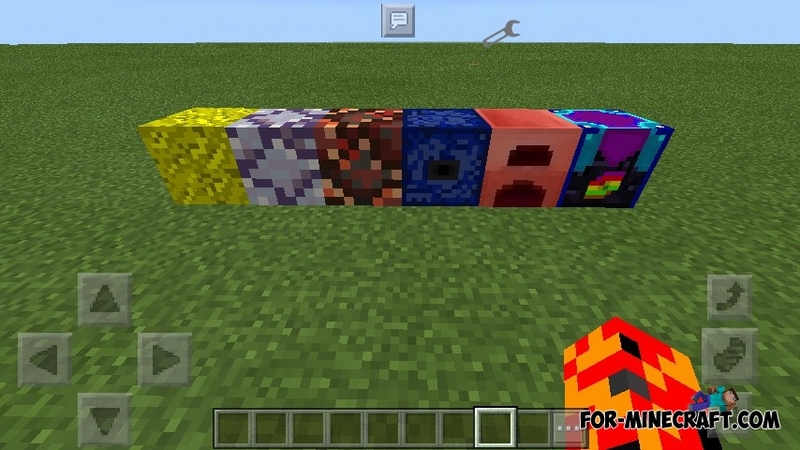 It can transfer energy 2 blocks back, forward, up, down, left and right respectively. All mechanisms require this energy. This mechanism is created specifically for the exchange of objects between you and the inhabitants of another world. Now for crafting you will have to swim a little and find an ocean monument. Kill the guardians to get the tears of the ocean (about one mob of three drops from 1 to 3 tears). The tears of the ocean are necessary for the crafting of oceanium ingots. The set consists of shelom (a helmet that gives underwater breath and night vision), yushman (a chestplate giving regeneration), latnica (leggings giving strength) and ichigi (boots giving jumping and speed). Some armor requires energy in the form of Soul of life, kill mobs to get it. It is a sword that can be improved by creating a stronger version of it (see crafting recipes below). To get the enchantment crystal (purple crystal) you need to put a diamond in the infinite ocean trader. This super-quality tools quickly extract almost all types of blocks, but they are not quite suitable for ordinary people because of their size, so they are enough for only 7 uses. The Pixie blade is required for the crafting of the devourer of souls. Dark fragments, ore, plate and core necessary for the Dark Energy generator crafting. Fire crystals, plates and core necessary for the Nether furnace crafting. Breath of the ocean stone, tears of the ocean and an oceanium ingot necessary for the crafting of the Infinite Ocean trader. New armor: Ancient armor giving additional health. New sword: Valiant killer having 40 damage. 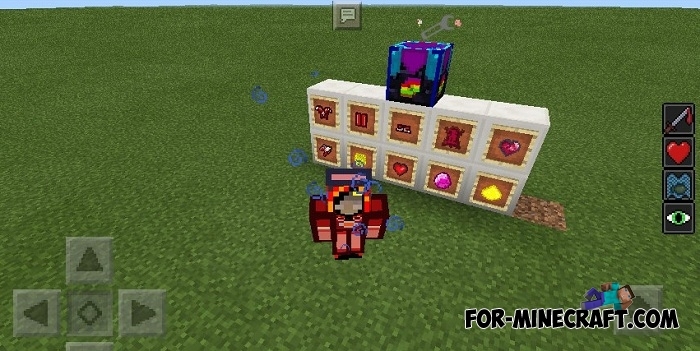 It's only available in the creative mode, but crafting will appear if you install the Defense Mod along with this one. 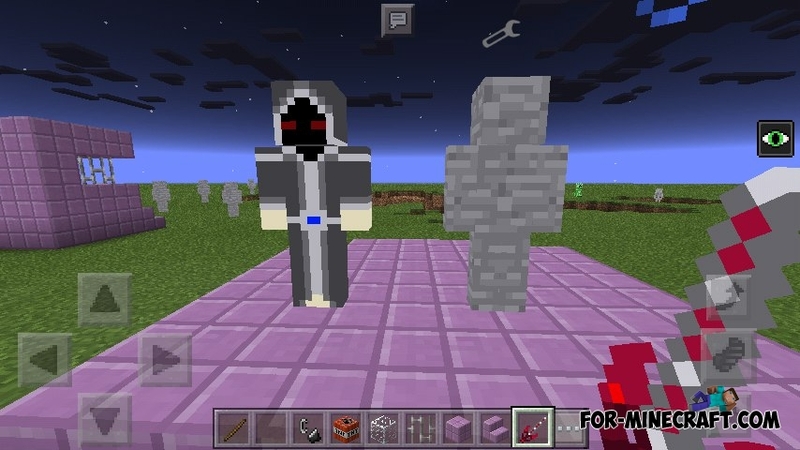 New mobs: Stone Mummy and Order Commander. To summon the latter you need to receive the Order Amulet, which drops from witches, villagers and iron golems. The Dark Energy Generator and the first level of the Soul Eater recipes has been changed (Now you will need a sword pixie instead of an iron sword). Added the Infinite Ocean trader and Nether furnace crafting recipes. How to install the Brave Miners mod? 1. Download the mod and Core Engine (click). 2. Then unpack the archive here: sdcard/games/com.mojang/mods/. Requires MCPE: 1.0.3 / BL 1.15.2.